It is magic. Patented technology calculates all the values for and generates the Incredible 1 Line Diagram in real time. All calculated with PowerCalc's 7+ million equations automatically designing the entire power distribution system in a building. And all in compliance with the NEC. Launch: the Incredible 1 Line Diagram (demo). With PowerCalc, changes are automatic and instantaneous upstream and downstream across your design. The Incredible 1 Line Diagram keeps up with each and every change. And, you can see it at all times. 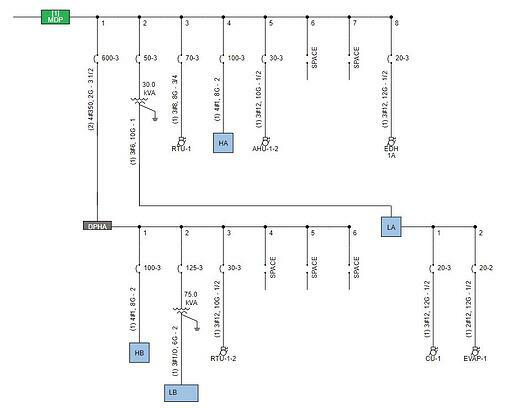 Your power distribution design is always up to the minute, ending fuss over this tedious task at the end of a project. The Incredible 1 Line Diagram is a simplified notation representing a single or three phase power system required for posting in commercial buildings and for building permits. All electrical elements are indicated with standard symbols: distribution panels, panels, building equipment, circuit breakers, disconnects, transformers, buss bars and conductors.The block diagram indicates the flow of power between the electrical elements showing feeder sizes, trip Amp, fault current analysis, equipment AIC and % Voltage Drop. In new construction the Incredible 1 Line Diagram summarizes the entire power distribution system. In renovation, the Incredible 1 Line Diagram is the starting point to determine the project's impact on the existing power distribution system. The values of the Incredible 1 Line Diagram indicate the information supporting the design's intent and confirm a balanced and protected power distribution system including: short circuit current, system grounding arrangement, voltage hierarchy and connection to the grid. Gone are the days of tediously putting together the 1 line diagram at the end of the project with constant revisions for changes. Now, your Incredible 1 Line Diagram is always there for you to see through every step of your design and every change you make.